Paul had had to learn that, and Peter also. In chapter 14, Paul has summarized his advice in terms that the weak in faith are those who cling to the past, but the strong believers should be tolerant of their weakness and encourage them by accepting their need for reassurance. Once this process of compromising differences in the Church is understood, our chapter becomes clear. Paul is saying: ‘Live with one another in friendship, with acceptance.’ ‘We who are strong have a duty to put up with the qualms of the weak without thinking of ourselves.’ In other words, loving one another is the main obligation; not checking whether this person appears to be more correct in his prayers than that person. ‘Each of us should think of his neighbours and help them to become stronger Christians.’ In other words, if this person finds it necessary to walk around the church to venerate all the icons but you do not, respect his devotion. 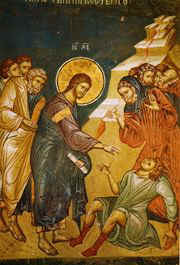 ‘Christ did not think of himself: the words of scripture - the insults of those who insult you fall on me – apply to him.’ This quotation comes from Psalm 68, v 9: ‘zeal for your house devours me, and the insults of those who insult you fall on me.’ In other words, if Christ is among us, then what we say to one another is said to him. Any disapproval we show to one who is more old-fashioned in faith than we are, is a reproach to the one who regards himself as stronger in faith, by not being old-fashioned. To be eaten up by love of being in church and praying is better than to be rotted with selfishness. ‘And indeed everything that was written long ago in the scriptures was meant to teach us something about hope from the examples scripture gives of how people who did not give up were helped by God.’ In other words, says Paul, I quote from the Psalms – the ancient prayers of the Jewish faithful – because all the Old Testament has a value for Christians. The beginning of the gospel is there, in the past: in the prophecies, which Jesus has fulfilled. So for us now, the example of the old people can strengthen us in our life in Christ. ‘And may he who helps us when we refuse to give up, help you all to be tolerant with each other, following the example of Christ Jesus, so that united in mind and voice you may give glory to the God and Father of our Lord Jesus Christ.’ In other words, I, Paul, know what it is to have to carry on with the utmost difficulty - when I have been beaten, stoned, or shipwrecked; or have been hungry, cold, hot, almost exhausted. And what you may think about those who cling to the past may be mistaken, because those people cling to what got them through their difficulties. But it is the unity of our life in Christ which is the main thing. ‘It can only be to God’s glory, then, for you to treat each other in the same friendly way as Christ treated you.’ ‘The same friendly way’ means mutual forbearance among those united in faith. The gospel reading resembles Matt. 20: 29-34. But it is likely that the blind, being beggars, would be associated in pairs, for mutual support; which explains the Lord’s saying Matt. 15: 14. Here, the risks of leading each other become the risk of trusting in his power. ‘Take pity on us, Son of David’. Jesus does not respond, but enters the house. Then he gives them his attention. Perhaps he has been exhausted through healing the woman with the haemorrhage and the daughter of the official (9: 18-26). Perhaps he mistrusts the two blind men, who by calling to him as a descendant of David seem to flatter him; and so he wants to be sure of their faith in his power. Jesus’ demand for faith is echoed by Paul, whose own experience of healing included regaining his sight (Acts 9). It is faith which is the point; not the words, whether formal like the beggars’ words or the behaviour, like the old-fashioned believers who seemed to be sticking to the old Jewish customs, but the quality of the faith itself. 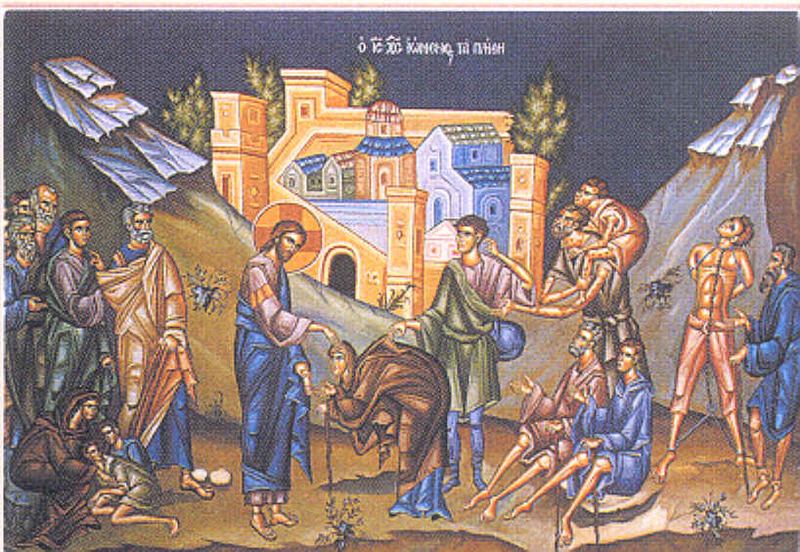 Jesus seeks faith in the beggars; Paul emphasizes faith to the Roman Christians. Firstly, we can see this as Jesus’ humility; as if he were to have said to the men that it was by the Father’s power and permission that he the Son had done this deed. Secondly, we can see this as Jesus’ way of reminding the healed men that this was not something to proclaim in order to get more money by begging. Thirdly, we can see this as Jesus’ way of ensuring that people will learn about this. He knows that the change from blindness to sight is so amazing that it must lead to declarations by the healed men and comments by observers. Certainly, Jesus does not desire to be praised as a miracle-worker only (Matt. 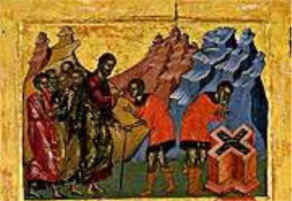 8: 4, 12: 16-19). The Messiah – the Son of David – is more than a miracle-worker, just as the promise of the kingdom of heaven is more than a state of self-government for Jewish people. But healing is a sign of the kingdom. The teaching, preaching and healing by Jesus will be continued by Paul, Peter and the other apostles. It all goes together. ‘It can only be to God’s glory, then, for you to treat each other in the same friendly way as Christ treated you.’ The Church is the Body of Christ; and he did what we can – and must - do. It all goes together. © Dr. M. R. Brett-Crowther. August 3 2003.